The concert hall of the Sydney Opera House is, of course, one of the world’s great venues. Filled to capacity of over two-and-half thousand the audience were displaying an enthusiasm that would continue throughout the night. Although older on average, there was a fair sprinkling of younger faces indicating that the reputation of one of the world’s great electronic and synth-pop bands was still continuing. 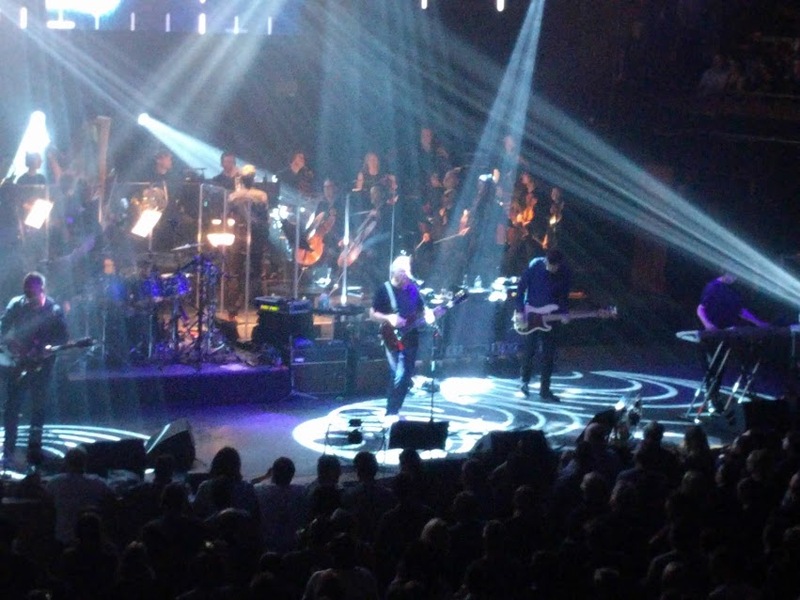 But this was not just a New Order concert, but also one of the Australian Chamber Orchestra. 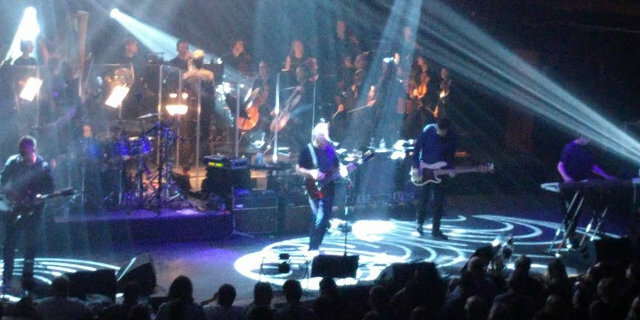 One can justly feel concerns about the attempts of contemporary music bands to cross into the territory of chamber orchestras, but New Order seemed to be a very good fit. They started with with the short version ‘Elegia’, combined with stunning old footage of Sydney harbour divers. Performed beautifully, the audience was temporarily awed into silence, hanging off every note. New Order themselves came out strongly with ‘Singularity’ from their new album Music Complete, a fast-paced driving dance-rock song which comes with a great music video mixing punk and riot scenes from the 1980s, which worked very well in the setting and set the standard for the rest of the night. It was followed by the unashamedly charming pop track from 1993, ‘Regret’, which was very well received, before returning a good performance of the new album’s content with the greed-themed and Arthurian-motif in ‘Restless’. For the older fans, an unfortunately flat, rather than sombre, rendition of ‘Lonesome Tonight’ was next, but better complemented by a better following performance of ‘Thieves Like Us’, New Order being one of the few bands that can sing about love without coming across as a bit naff. It was also where, once again, the Australian Chamber Orchestra provided ample evidence that this was their concert as well. There was a little of switching back-and-forth at this point, as the next track was a fair performance of ‘The Game’ from the new album, followed by a slightly disappointing presentation of ‘Your Silent Face’. The latter was particularly a shame for your reviewer, as it is his favourite New Order track. Relying on keyboards to be just right, they were too loud and the resulting distortion spoiled what is a great song. Even with this issue, it was superior to vacuous drivel that constitutes Tutti Frutti that followed. This however, was a turning point in the concert as the band turned on a great performance of the ever-popular ‘Bizarre Love Triangle’ which had a good proportion of the audience leaving their seats – but certainly not leaving the hall. They remained in position through the acceptable ‘Waiting for the Siren’s Call’, to return to a level of exuberance for a four-part medley ‘The Perfect Kiss’, ‘True Faith’, ‘Blue Monday’, and ‘Temptation’. The last song in particular witnessed a very and impressive contribution by members of the ACO a number of whom seemed to be taking a more active role than the conductor was perhaps entirely comfortable with. For an encore, there was a return to the distant past with three Joy Division tracks; ‘Atmosphere’, ‘Decades’, and a not-unexpected, ‘Love Will Tear Us Apart, providing a great capstone for what was a two-hour performance. Again, the contributions of the Australian Chamber Orchestra especially in the first two songs of the encore were notable. It is some thirty years since your reviewer last saw New Order perform a somewhat shorter set at Canterbury Court in Western Australia. At the time they had a justified reputation for being somewhat indifferent to their audience. This has obviously changed. The had banter, enthusiasm, and even justifications when vocalist Bernard Sumner made a fair point of sounding a little odd on account of a cold – not surprising given the stormy weather. Combined with an audience that obviously wanted more, and a very worthy setting, it created in aggregate an atmosphere of one of an utterly superb concert. Scott Walker and the freedom to go seriously weird.